Intel i5, 4 GB RAM, 1 TB HDD, Window 10, 18.5" Screen. Microsoft Office and Antivirus, Warranty of one year or above. (Mention Model number, Brand name, software included, operating system & other specifications Properly).All these must be duly match with the Brochure provided by the company). 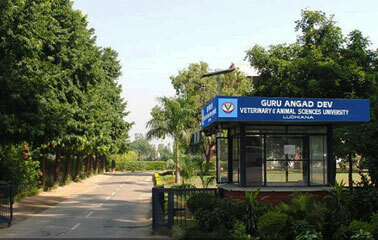 The quotations may be sent in the name of "Director of Research" and should reach by post or by hand on or before 15.11.2018 till 11:00 am in the office of Director of Research, Guru Angad Dev Veterinary & Animal Sciences University, Ludhiana. Quotations shall be opened on 15.11.2018 at 11:15 AM. The University is exempted from the payment of GST as per Notification no. 47/2017-Integrated Tax (rate) and the exemption, wherever applicable, will be availed by providing GST Exemption Certificate. Valid GST number and HSN code of product must be mentioned on quotation. The rates of the items must be quoted with all the terms & conditions and must be FOR GADVASU, Ludhiana destination basis and should include all types of taxes and charges including insurance, custom duty against Custom Duty Exemption Certificate, clearance and transport charges etc. Supplier will be responsible for clearing the item from the custom department and deliver the same to the University if applicable. Rates quoted must be valid up to 2-3 months. In case prices slash down or any other benefit (in form of lesser price/lesser tax/ foreign exchange rate etc.) it must be passed on to GADVASU. The University is exempted from the payment of excise duty and the exemption, wherever applicable, will be availed by providing ED Exemption Certificate. The University will pay only Basic Custom Duty and the exemption, wherever applicable, will be availed by providing against Custom Duty Exemption Certificate. Incomplete quotations, without brand name or received after due date/ time shall be rejected forthwith. University does not take any responsibility for any postal delay in delivery by Registered/ Speed Post or lost in transit of the quotation. Conditional and unsigned quotation will not be accepted. Delivery period of the items must also be intimated clearly in the quotations, no further correspondence in this regard will be communicated by the University. The quotation shall not contain corrections, erasers and overwriting, it will result in rejection of quotation straightway. Valid authorization certificate issued by the manufacturer may be attached with the quotation. The University reserves all the rights to accept or reject any/all quotations(s) and to increase or decrease quantity or configuration of items specified without specifying any reason. No correspondence will be made on this matter. Above mentioned Quantities are tentative and can be increased/ decreased to any extent or can be totally omitted according to sanctioned amount & the firm will have no claim on this account. If the date of opening of quotations is declared as Public Holiday then the quotations will be opened on the next working day at the same time. The terms & conditions will remain the same. The standing committee will open quotation of only those firms whose quotation is found to be in order. On the basis of performance of the distributors/firms/agencies, (i.e. quality of material supply, timely delivery of material etc.) the standing committee reserves the rights to reject any or all quotations. In case of any dispute, jurisdiction will be Ludhiana District Courts. Any detail regarding the item/material can be obtained from office of Director of Research, GADVASU, Ludhiana.